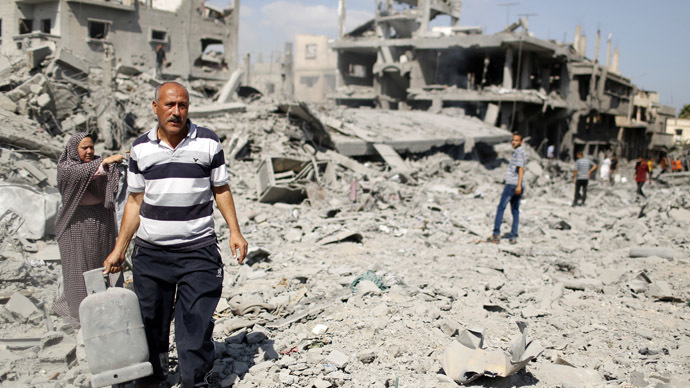 Israel maybe committing war crimes in Gaza, the UN High Commissioner for Human Rights says. Speaking in Geneva, Navi Pillay said house demolitions and the killing of children raise the "strong possibility" that Israel is violating international law. Opening an emergency debate at the UN Human Rights Council in Geneva, she citied cases of Israeli air strikes and shelling hitting houses and hospitals in the coastal enclave: "These are just a few examples where there seems to be a strong possibility that international humanitarian law has been violated, in a manner that could amount to war crimes,” she said. She hit out at both sides concerning their conduct during the conflict, which is now in its 16th day, having started on July 8. Some 643 Palestinians, many of them children and civilians have died in the conflict, including a seven-year-old hit by a shell in southern Gaza early on Wednesday, Reuters reports. 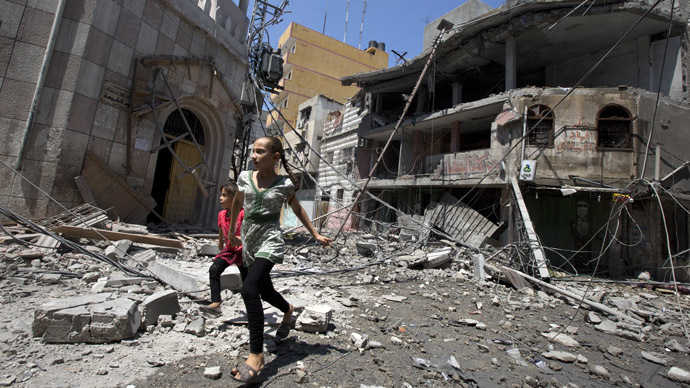 The Israeli army has been accused of targeting civilian areas, as well as using flechette shells during its offensive in Gaza, which can cause widespread harm and death to civilians. Some 29 Israeli soldiers have been killed, including a tank officer shot by a Palestinian sniper early on Wednesday. 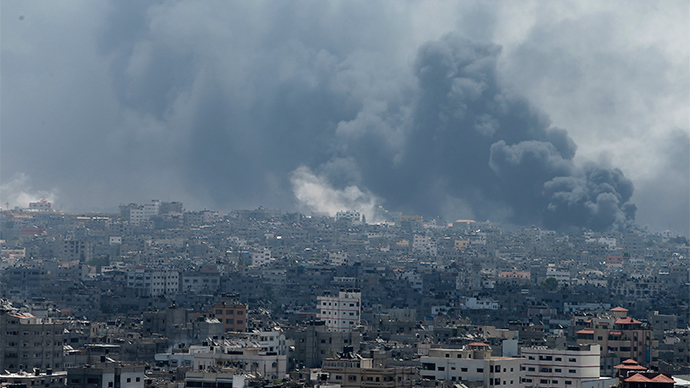 On Monday, a hospital was hit in Gaza, with four people killed and scores of others wounded in the attack. Thirty of the wounded were medics. The International Committee of the Red Cross issued a statement condemning the shelling "in the strongest terms," Reuters reported. The organization stated that the hospital came under fire at least four times, and life-saving equipment was severely damaged. A United Nations school, which is helping to shelter displaced Palestinians in the center of Gaza, also came under attack from Israeli fire on Tuesday as a team was inspecting damage from shelling by the Israeli’s on Monday, a UN official said. The official mentioned that a team, who had been given permission by Israel to enter, were at the school run by the UN in Al-Maghazi, when Israeli tanks resumed their shelling and hit the building. Speaking at the conference, Israel’s ambassador to the body, Eviatar Manor told the debate that “Israel will destroy Hamas’ military infrastructure.” He also added that “the Gaza residents are not our enemy. Israel is fully committed to international law.” The ambassador also slammed the UN Human Rights Council saying they had "failed to protect the human rights of Israelis,” Haaretz reports. In response, the Palestinian Foreign Minister, Riad al-Malki urged world powers to end what he called Israel’s impunity, saying, "Israel must be held accountable for its crimes." His speech was greeted by loud applause. Harretz reports that the Palestinians and Arab countries have filed a draft to the Human Rights Council, which convened for a special one-day session in Geneva, which includes the establishment of an international commission of inquiry to probe alleged war crimes and violations of international law. The draft does not mention Hamas. 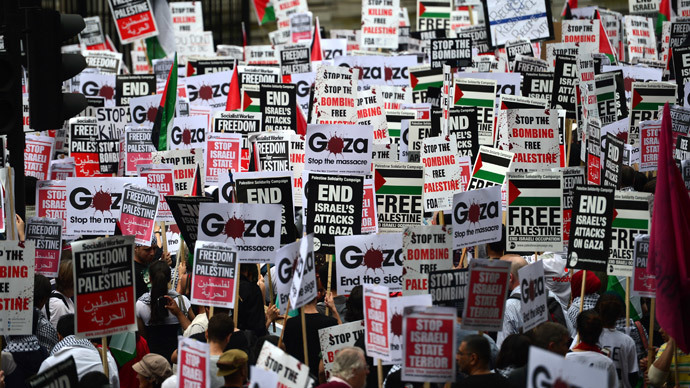 Despite Israel lobbying the Council's member states to prevent the meeting taking place, the Palestinians managed to get the signatures necessary to hold the meeting. The US, most of the EU states and additional Western states, including Australia and Canada, are expected to oppose the draft. However, as in other UN bodies, the Palestinians hold an automatic majority which allows them to pass any resolution. Israel, which accuses the Council of bias, boycotted the Geneva forum for 20 months, resuming cooperation in October. Its main ally the United States, a member state, has also said Israel is unfairly singled out.